A passion to play, in the mere sense of the word, a craving for music which leads to embrace all kinds of music, unbiased and unrestrained. A self-taught formation in the beginning and then the CNSM of Paris and the IRCAM make him discover chronologically rock, classical music tradition and the "contemporary" music. 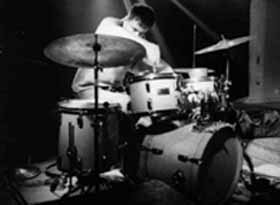 Of course, jazz deeply influences his way of playing drums, more and more pushing him to free improvisation. A band which allows him to gather all the forces that lead him and let him discoveer improvisation : Shubniggurath, first record in the 1990 autumn. - drummer, composer, improviser and researcher believer of self-denial a claimed evolution where everything has to be possible.